The first “Coca-Cola girl” to appear in advertising for this worldwide brand was Hilda Kathryn Clark, a popular actress and singer who worked in music halls of the day, according to a BusinessWeek online article. Some sources indicate the start date of Clark’s relationship with Coke began in 1895, others state 1899. 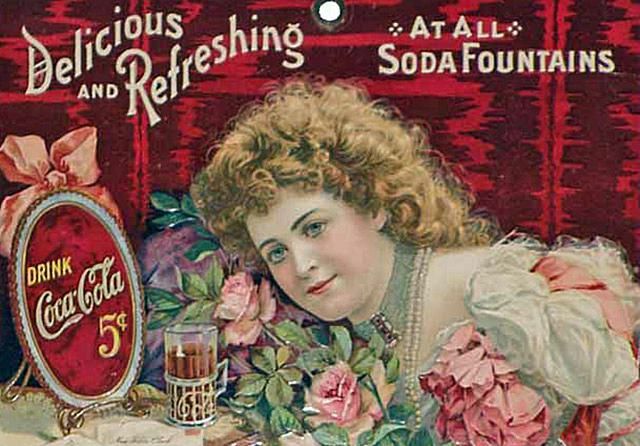 Regardless, the Victorian beauty became even more popular with fans as her image was widely associated with this prolific brand introduced in soda fountains during the late 1800s. Clark was originally from Kansas, and moved to Boston to pursue a modeling and acting career. She worked as the first “face” of Coke, a spokesmodel in more modern terms, until 1903 when she married Frederick Stanton Flower, nephew of New York Governor Roswell P. Flower. She also retired from the stage when she gave up her modeling career, according to Wikipedia. Interestingly, at the time when Clark originally appeared in Coca-Cola advertising, the drink was only available in soda fountains and pharmacies so most of the items that bear her likeness were used or distributed in those businesses and produced in more limited quantities than later consumer goods. Clark appeared on calendars, trade cards, tin serving trays, advertising signs, and other varied memorabilia, all of which is now considered very collectible by Coke enthusiasts. This Coca-Cola celluloid bookmark dating to about 1900 features Hilda Clark. It is in excellent condition with only two tiny soil dots on the plain back. The colors are strong and there are no cracks. This 2 1/4" piece sold for $600 (not including buyer's premium) at Morphy Auctions in October of 2013. 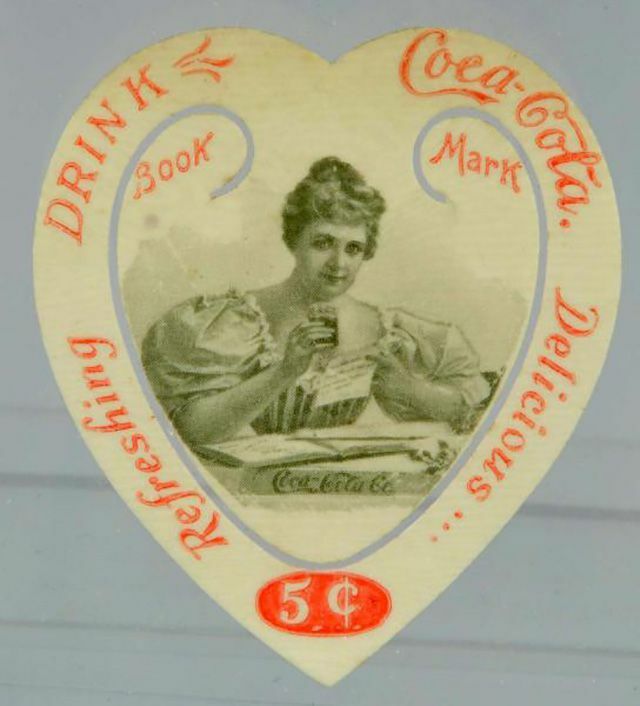 Advertising items featuring Hilda Clark, the first "Coca-Cola girl," are so beautiful and popular with collectors that many have been reproduced. This is especially true in regard to commemorative tin trays made during the 1970s and ‘80s. These commemoratives will be marked on the back noting them as such. Trays found today without dating notations on the back may be reproductions, since most of the older examples like these are now in collections and don’t come up for sale often. When they do, they usually sell in excess of $1,000, and some can be worth far more. This sign, made by Chas. W. Shonk Co. of Chicago, shows Hilda Clark in the center holding a glass of a Coca-Cola. The sign is framed with a very ornate wood and gesso frame. Even though there are numerous scrapes and rubs to the rim and field of the sign, as well as a prominent bend to the bottom edge does, it displays very nicely. Nicely enough, in fact, that it sold for $2,700 via Morphy Auctions in December of 2016. Like many other beautiful ladies through the decades, Hilda Clark appeared on a number of Coca-Cola calendars. What was unique in her instance is that she was the first "face" of Coke. Being the first, that means she's on some of the oldest and most valuable examples. The calendar shown here is a scarce Hilda Clark collectible. Although it retains only the December, 1901 sheet from its monthly pad, and the lower right corner has restoration, these issues don't greatly diminish the value. The image of Hilda Clark is in very good shape, although the upper section of the embossed area does have some minor wear. It sold for $1,400 (not including buyer's premium) in June of 2013 through Mosby & Co. auctions. Had it been complete with a full calendar pad, it would have likely sold for even more given the vivid coloring and attractive illustration. Other Hilda Clark Coca-Cola items are also rare and valuable. Colorful menu cards have been known to sell at auction for $1,500 or more. Beautiful posters sell from several hundred dollars to several thousand, depending on the rarity and condition. In fact, an easel-backed cardboard sign with Clark’s face prominently featured sold for $45,000 in October of 2103.